Mac and cheese is our family’s favorite comfort food. 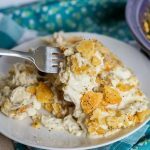 My husband requests it for every holiday dinner, and though I’ve always been able to get a good flavor, the clumpiness drove me crazy. After trying for years to get it right (oven recipes, stove-top recipes and several attempts at a crock pot version), I’ve finally nailed it. 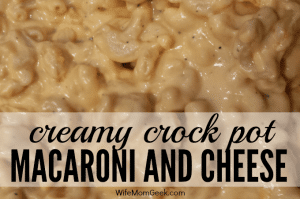 Here’s our version of Creamy Crock Pot Mac and Cheese. 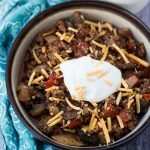 Note: This crock pot recipe is a little heavy on the sour cream flavor, but that’s how our family likes it. It’s based off of my friend Jessi’s recipe, with a few modifications. You can probably reduce the sour cream and add another can of cheddar cheese soup with the same effect. This creamy, cheesy mac and choose is packed with cheesy flavor and goodness. Boil macaroni in water for 6 minutes. Drain and add to crock pot. In a large saucepan, melt butter and 4 cups of cheese. Stir until the cheese melts. Add the melted cheese, the unmelted sharp cheddar, sour cream, soup, evaporated milk, salt and pepper to the crock pot. Cook on low for two hours, stirring every 30 minutes or so. This post contains affiliate links, which means that I may get a commission at no additional cost to you if you sign up and/or make a purchase. I only recommend products that I use and love myself, so I know you’ll be in good hands. For more details, read my full disclosure. There were some awesome black friday deals on crock pots. I decided to pass it up because I have NO idea what to make in one. But your Mac & cheese looks so good, maybe I should reconsider. I’m curious about the sour cream flavor you mentioned. I may have to try this and see! Hope you like it. The cheese flavor is stronger, actually, but some people don’t like sour cream and may notice that flavor, too. Anytime is a good time for mac and cheese! I love Macaroni and Cheese! This Macaroni and Cheese looks awesome! This looks SO good! I love making dinners in my slow cooker in fact, I’m planning on doing 30 straight days of slow cooked meals when our second child arrives this month so this is definetely going on my list of recies to make! Thanks for sharing! Wow you are so creative. I would never think to make mac and cheese in the crock pot. My toddler is obsessed with it so I have to try this awesome recipe! 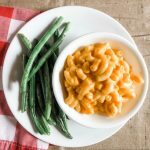 Mac and cheese – now who wouldn’t want those! Yumm!!! I have never tried mac and cheese in a crockpot. What a fun idea. This looks delicious! I love how creamy it is. 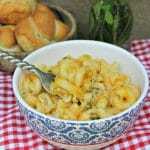 I love the idea of homemade macaroni and cheese! 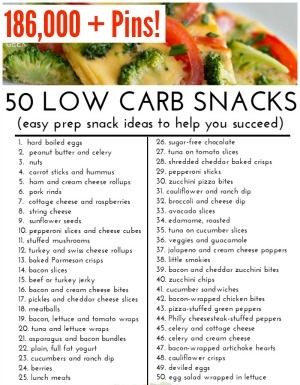 Too many times people just buy the packed, pre-made one and that’s not the healthiest option. Thanks so much for sharing! GIRL! This looks incredibly delicious! It seems simple enough too, I’m all over anything crock pot. This looks super good! I love adding bacon and jalapenos’s to my mac n cheese. What a great idea! I’ll have to try different flavor variations, especially this one! Humm, you’re going to make me change up dinner plans tonight! I’m going to try the evaporated milk and soup. Get outta here, crock pot mac and cheese! That sounds soooo good, I’ll have to make it asap! I love mac n’ cheese and this sounds so delicious! Will be giving this a try next time. I have never heard of condensed cheese soup… I think I’ve been missing out! The only thing I ever use it for is smoothing out cheesy casseroles. This looks absolutely delicious! I could easily be mistaken for a 12 year old by what I eat haha. This looks like a much more delicious, adult, and cheesy version of the box Mac and Cheese that I eat. Thanks for the post, pinned it! Thanks for pinning. Yes, it is a more adult version–with loads and loads of cheese. LOL Kids love it, too, though! Stacy, I make this every year for Thanksgiving and Christmas (and nearly every family get-together), and it makes enough for the 15 of us with generous helpings. It fills a 6-qt. crock pot. Awesome thanks so much! I’m making it for Christmas Eve to go with roast beef sandwiches!! That sounds like an awesome pairing! Let me know how you like it! I’ve never made mac and cheese in the slow cooker. Your recipe looks delicious! Thank you for sharing it with us at the Hearth and Soul hop. this looks so yummy! 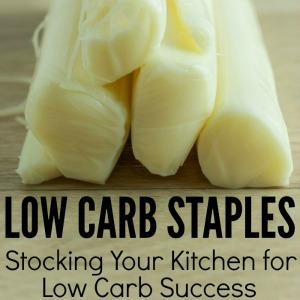 Since my crock pot is my favorite kitchen tool I’ll have to give this a try! Oh wow, that looks so good!! I don’t know if our son would let us have any, though. Might eat the whole thing!! 🙂 Pinned it! 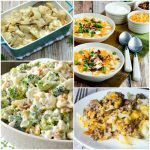 What a great way to have homemade mac and cheese ready to go!